Caroline turns Michael over to the police. Broadcast on Channel 5 (UK) 05 August 1997 Tue 11:30 p.m.
Debbie does not appear in this episode. Officer Barfield (Kate Fell) now has her hair scraped back Vera-style. Michael is arrested when the police arrive at the halfway house, as Caroline has called them while out of the room. The police tell Jim that Michael has been arrested but warn him that Geoff is still after him, so he is under permanent police guard. Meg finds the money from the Salvos' collecting tin in Lizzie's handbag when she returns from her visit and hands it to Erica who suspends Lizzie's buyup for a week. Judy hospital visit hasn't made her feel any better about the operation. Ken suggests to Erica that the women might be ready for a performance such as a play reading and she agrees to give them an hour's rehearsal time. Lizzie is wracked with guilt when Captain Barton comes to visit, and has to be forced to go out into the garden to talk to him. Ken tells Bea her talk had the required effect and Debbie has gone back to live with her mother. The women have difficulty reading the script of "A Midsummer Night's Dream" (though as it's the mechanicals scene any bad acting would not be out of place). Captain Bennett isn't angry with Lizzie and gives her a hymn book as a present. Judy tells Erica she doesn't want to see Captain Barton and when he comes to her cell to see her anyway, she tells him she doesn't believe in God and doesn't want to be "saved", as she enjoys being a lesbian. Bea is disturbed to overhear that Ken is planning to hand over the running of the drama group to the women themselves and so might not be visiting for much longer. Sharon and Lizzie squabble when Lizzie's newfound religious fervour starts her preaching at Sharon's "immorality". Caroline is told that Michael has been refused bail and will be held in a psychiatric unit, possibly permanently. Lizzie announces she's giving up smoking. Erica tells Meg and Vera that Kerry Vincent is to be transferred from Barnhurst and that special arrangements are to be made for her. The police surround Geoff Butler's hideout, but he manages to get past them and makes his escape by car. Lizzie is moved to share Bea and Doreen's cell to make room for Kerry, who gets a large cell to herself to give her room for all her artists' materials. 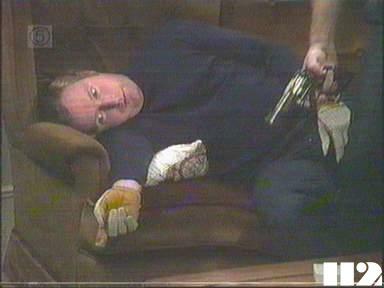 Jim tells the police to call off the surveillance and he will disarm Geoff himself. Kerry works in the laundry and tells the women she's an ex-prostitute and was imprisoned for killing a man with an ashtray. Doreen sees Kerry set up an easel in the garden, and finds out that Kerry has an agent who's arranging an exhibition of her work. She also finds out that Ken Pearce has supported Kerry's work, which makes Doreen suspicious that Kerry must be paying him back ... somehow. Jim arrives home to find Geoff waiting for him. There is a gunshot, but it is a police marksman firing through the (presumably wide open) French windows at Geoff . The guard on Jim was not called off after all.